When the Tampa Bay Lightning face off against the Detroit Red Wings on October 13th, coach Jon Cooper will face the dilemma of which goalie to start between the pipes. Ben Bishop has the experience, but Andrei Vasilevskiy is the future face of goaltending in Tampa Bay, and is by no means just Bishop’s back-up. So which goalie does Cooper go with on opening night? So last season’s stats don’t really tell us anything different. Bishop puts up better numbers on the ice than Vasilevskiy although the overall effect on the team’s win percentage is almost negligible; the Lightning won 57 percent of games in which Bishop started, compared to 52 percent with Vasilevskiy. It’s unlikely that 5 percent difference would be the deciding factor between lifting the Cup and finishing as runners up. Although nothing’s impossible. Drafted 19th overall in the 2012 entry draft, Vasilevskiy caught a decent number of regular season games in the 2015-16 season, but really came into his own when he replaced the injured Ben Bishop in game one of the conference final. The Pittsburgh Penguins won that series 4-3 although Vasilevskiy finished the series with a strong .925 SV% against the eventual Stanley Cup winners. Bishop’s time with the Lightning is running out. He becomes an unrestricted free agent at the end of the season, whereas Vasilevskiy signed a three year contract in July worth $10.5 million. 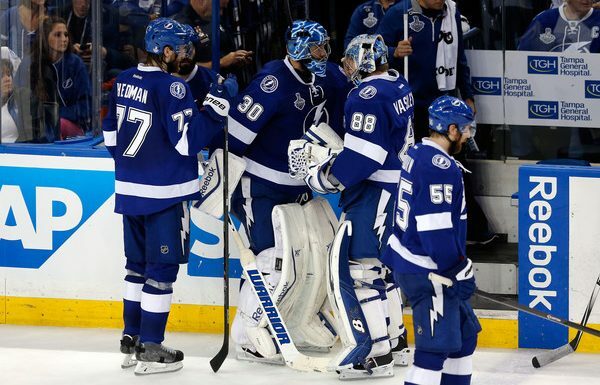 There’s also a small matter of the expansion draft; Tampa Bay can only protect one goalie. Although Vasilevskiy’s numbers are a little behind Bishop’s, in reality the two goalies are very close, and that’s a nice problem for Tampa Bay to have. That said it doesn’t make Cooper’s choice any easier. Will we see one goalie take the lion’s share of games while the other gets the dreaded back-to-back road games? Possibly but probably not. The Bolts will want to get their money’s worth from Bishop before he goes, but at the same time Vasilevskiy will need to get solid ice time so I’m expecting to see something like a 50/50 split, barring any injuries of course. Back to the question in hand, who will start against Detroit? My bet is Cooper will call on Bishop’s experience on opening night. I’m worried about the Detroit Red Wings this season but you can never count them out. What’s your take? Comment below or join in the conversation on twitter.